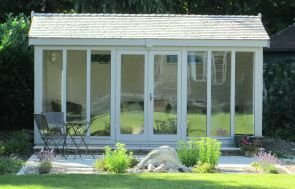 This Binham Studio has recently been installed in our customer’s garden in the rolling hills of Ledbury Bush, Herefordshire. The customer has got a quaint little cottage, and the Binham, perched on top of this hill, will become a great extra room for them. Before this gets much use though, it is going to be decorated to be made fit for the customer’s wedding reception in August (congratulations!). This Binham is 6 x 6m in size, which is the largest we do. It is so big that there’s a partition, 2.4m from the back of the building, which will be a great storage area. The main section at the front of the studio is 3.6 x 6m, which will be a great space to decorate as they wish and turn into a wonderful living area. With a small house, an extra space like this will add a lot of extra possibilities and give the customers a great opportunity to be creative in how they manage the space they’ve got between their home and in this studio. With this being such a large garden building, ventilation is a big concern, and this studio has got a total of eight opening windows, as well as double doors at the front. Grey slate composite tiles have been used on the roof, and the shiplap cladding has been finished with Sage Valtti paint. The windows and doors have been painted in Ivory Valtti paint. Inside, there is natural matchboard lining and insulation, which gives the inside a smooth finish. There is also an electrical pack with a heater, so this studio will be good for use all year round. 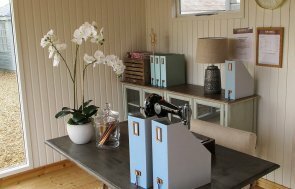 This Binham Studio has got great views over the Herefordshire hills, and we hope the customers get a lot of enjoyment out of it and have a wonderful wedding reception in it. If you like the look of this and would like toconfigure your own Garden Studio using our Online Garden Building Planner Tool, or, if you would like to speak to someone about the garden building of your choice before you purchase it, you can Contact Us or call us directly on 01760 444229 to speak to one of our friendly team.